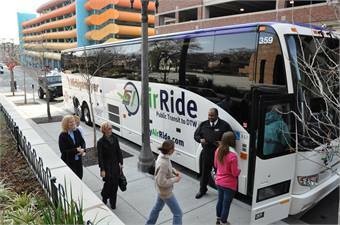 A partnership between Indian Trails and TheRide increased the daily frequency of roundtrips from eight to 12 on the Ann Arbor/DTW segment of Michigan Flyer’s route from East Lansing. Sometimes viewed as adversaries, public transportation agencies and private motorcoach operators are teaming up to expand transportation options in some areas with agreements called public-private partnerships (P3). The P3 agreements are proving to be extremely beneficial for both private operators, who have focused on diversifying their operations post-9/11, and public transit agencies, who are trying to capitalize on growing demand by offering even more services. METRO spoke to two motorcoach operators, and a public transportation agency, about their P3s and how and why they have proven to be successful. In 2006, Michigan Flyer was founded by Indian Trails and Okemos Travel as the first intercity bus carrier to serve Detroit Metro Airport (DTW) on a daily, regularly-scheduled basis. Following the adoption of a 30-year vision calling for better regional public transit connections in 2011, TheRide and Michigan Flyer formed a P3 to operate a new public transportation service, “AirRide,” with 12 daily roundtrips scheduled between Ann Arbor and DTW, beginning in April 2012. The new partnership increased the daily frequency of roundtrips from eight to 12 on the Ann Arbor/DTW segment of Michigan Flyer’s route from East Lansing. Michael Ford, CEO of TheRide, explains the partnership came about when residents in the Ann Arbor area said they needed a convenient, affordable and reliable way to get to and from DTW. In 2011, TheRide reached out with a formal bid to partner with a private carrier to launch and operate a new airport shuttle service. The shuttle service serves nearly 60,000 passengers a year. Standard one-way fares are as low as $12 between Ann Arbor and DTW. Michigan Flyer also provides airport shuttle service for customers in East Lansing that complements the public transportation leg between Ann Arbor and DTW. AirRide’s $1.3 million budget does not include any funds from local property taxes, but relies on a combination of passenger fares ($829,837), state operating assistance ($385,817), purchasing of service agreements ($199,900) and federal discretionary funds ($11,374). Michigan Flyer/AirRide’s fleet of comfortable, eco-friendly 52-passenger motorcoaches make near-hourly trips each day, with 98% on-time reliability. Altogether, they connect with approximately 700 daily nonstop airline flights between DTW and top domestic and international destinations. Cushman compares bringing together the perspectives of the public sector and private sector in a joint enterprise is a little like two people getting married. 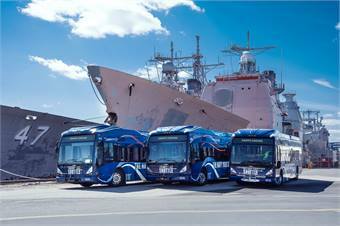 Through their experience with P3s and working with Transportation Management Associations, Krapf’s Coaches has been able to secure even more work, including shuttle service for the corporate center at the Philadelphia Navy Yard. West Chester, Pa.’s Krapf’s Coaches Inc. has several P3s in place not only with SEPTA but with nonprofits as well. Krapf’s won its first SEPTA contract in 1994, and over the years, has done work in the suburban outliers the agency serves with smaller equipment Krapf’s can operate more efficiently because of proximity. Currently, Krapf’s holds three separate contracts with SEPTA — two fixed route and one paratransit. Krapf says the Request for Proposals (RFP) process typically associated with public transportation service bids can be daunting, especially for smaller “mom and pop-type” motorcoach operators. Krapf says that his father Dale and their operation began exploring P3-type arrangements even before 1994, when then President Ronald Reagan created legislation pushing for transit agencies to subcontract a percentage of their services. He says that over the years, he has seen even more competition for contracts as they come back up for rebid. Krapf’s also has several other P3 transportation agreements with TMAs, where the operation provides shuttle services in both Pennsylvania and Delaware, which often are partially funded through federal Job Access and Reverse Commute (JARC) grants. Krapf says there is literally a TMA for every suburban county of Philadelphia. Krapf says one way operators can stay aware of these types of opportunities as they arise, is to join the TMAs in their areas and interact with members of the local transportation agency’s board, if not outright becoming a member of that board. Krapf says being active in these groups has opened the doors for other business opportunities.